Goddess Kali is the aradhya Devi of West Bengal. Kali Puja is celebrated with great fervor all over the state. It is one of the biggest festivals in Bengal. Kali Puja was introduced in West Bengal in the 18th century by Raja Krishnachandra. It gained traction during the 19th century, when it became a matter of pride and pomp among the elite of West Bengal. Kali Puja honours Goddess Kali by raising huge clay sculptures and pandals all over the state. The pandals are visited by people throughout the night. Many dance, music and firework shows are organized. She is given a special offering of hibiscus flowers, sweets, animal blood and meat. Kali Maa is known as the destroyer of evil and evil forces. She is also known as Bhadrakali, Chamundi, Shasan Kali and Dakshina Kalika in this area. She is portrayed either dancing or lying prostrate on Lord Shiva, who is her consort. Kali is the effeminate form of Kala, a sobriquet of Lord Shiva. Kali is often shown in the four-armed form or the ten-armed Mahakali form. Her eyes are red with rage, her hair is unkempt and disheveled and her fangs jut out from her mouth, while her tongue is hanging out. Here are some of the must-visit, famous Kali temples in West Bengal. 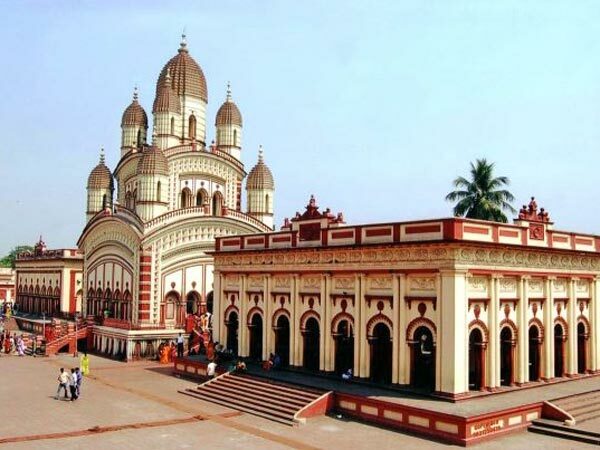 Dakshineswar Kali Temple near Kolkata is one of the majorly worshipped temples in Bengal. The temple was built by Rani Rashmoni between 1847 and 1855. This is the temple where Ramakrishna Paramahamsa worshipped his aradhya Devi Jagadishwari Kalimata Thakurani. Located on the banks of river Hooghly and bound by 12 identical Shiva temples on either sides of the ghat, it is built in the Navaratna style of Bengal architecture. The sanctum sanctorum (garbagriha) houses Bhavatarini, a form of Kali. Kalighat Temple is one of the prominent temples of Kolkata. The name Calcutta is said to have been borrowed from the word ‘Kalighat'. This temple was erected in the 19th century by Raja Manasingha and is considered one of the 51 Shakti Peethas of India. The portrayal of Kali in this temple is quite different from the images that are prayed across Bengal. The important parts of temple are Sosthi Tala (where all the priests are women), Natmondir, Jor-Bangla, Harkath Tala, Radha Krishna Temple and Kundupukur. Tarapith is also one of the 51 Shakti Peethas. The presiding deity is Tara and she is represented in her fiery form with four arms, a garland of skulls and the tongue lolling. It is located in Rampurhat and is situated right opposite a cremation ground. Many believe that the Goddess here is drawn to bones and blood; hence, the cremation ground is her chosen abode. There is a holy tank adjacent to the temple, where the devotees are supposed to take a dip in before entering the temple premises. The water in this tank is said to have special powers that can even bring back the dead to life. Kali Maa is worshipped and revered in the form of Tripura Sundari in this temple. She is settled on a lotus that is emerging from the navel of Lord Shiva. This temple is not as well frequented as Kalighat, even though it is located in Kolkata. The five prominent Gods of Hinduism-Rudra, Ishwara, Brahma, Vishnu and Maheshwara-also known as Panch Devatas are found at the feet of Goddess Tripura Sundari. Located in Bansberia of Hooghly district, the presiding deity of this temple is Hangsheshwari. This temple is an illustration of Tantrik Satchakrabhed form of architecture. This architecture depicts the structure of the temple like the structure of a human anatomy. The temple is five storied, which represents the five parts of the human body, namely Bajraksha, Ira, Chitrini, Pingala and Sushumna. There is an Ananta Basudeba Temple located inside this temple complex. This temple is an amazing exemplification of the terracotta artwork of West Bengal. Kiriteswari Temple is also one of the 51 Shakti Peethas in India. It is also known by the name of Mukteshwar Temple. When the original temple, which is one of the oldest temples in Murshidabad, was on the brink of destruction, the present temple was constructed by Darpanarayan in the 19th century. It is believed that when Lord Shiva was carrying around the corpse of Sati, the kirit (crown) of Sati fell in this place, hence, the name Kiriteswari. The representation of the Goddess in this temple is just a black stone. Situated 10 km from the school and ashram of Rabindranath Tagore, Santiniketan, Kankalitala temple is also a part of the 51 Shakti Peethas. It is at this place where the Kankal (waist) of the Goddess Sati fell. Situated on the banks of river Kopai, the Goddess of this temple is addressed as Devgarbha. The Goddess is said to be lying on the floor underwater of a natural pond. The temple is built adjacent to the pond, where a photo of Goddess Kali is framed and worshipped.